Everyone knows that Limewire, Pirate Bay and KickAssTorrents are not words you go shouting about, or even mentioning without looking over your shoulder first. We all know downloading music and movies is illegal, although it doesn’t really feel like that big of a deal… It’s not like you’re robbing a bank or committing a murder. It doesn’t even feel like a “crime”. It’s not like you’re hurting anyone or that anyone will find out or care you downloaded some stuff. Right? But the reality isn’t so pretty. Yeah yeah, I know we’ve all heard it before, it’s stealing—but so what? I’ll tell you what, and hold tight because I’m dropping the REAL myth-buster in just a couple paragraphs, plus something really exciting. It’s a crime punishable by hundreds-of-thousands of dollars, and you will likely spend quite a few years in jail. Yikes. And the person you’re hurting the most, besides yourself potentially, is the artist—whom you’re a pretty big fan of if you’re downloading their music. Although, many of us may feel like “Well yeah I like Beyoncé, and I’m downloading her songs because duh hello…but honestly I don’t really give a flip about stealing from her, she’s rich af!”. True story, she is rich af, but it doesn’t make stealing any less of a crime unfortunately, or the penalty any less harsh. So how come nobody gets caught? Actually they do, it’s just not something you usually hear about on the news (the news tends to cover things much more entertaining, like what’s new with The Bachelor, how pregnant Beyoncé is, and Trump’s ever-changing hairstyle). Although, you may have heard about that Minnesota woman who was fined $1.9 million for downloading just 24 songs illegally, according to CNN.com. That was a whopper. Ok, so what does this have to do with downloading sheet music? You may only be an innocent cello player in your high school band just trying to learn the Moana soundtrack! Well my friend, you’re not so innocent if you’ve been downloading free sheet music. Unless it’s Mozart or Mary Had a Little Lamb, if it’s free, it’s illegal. With the exception of course if it’s a licensed distributor of legal sheet music offering a promotion or a sale. Like we happen to be right now! 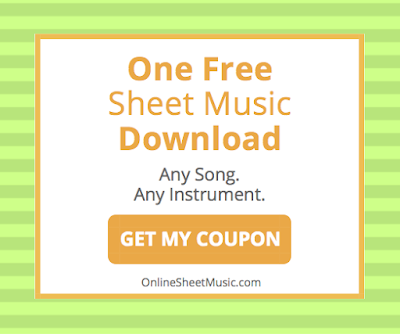 We’re offering one free download of the sheet music for any song on any instrument of your choosing, totally free, and totally legal! Click here to get your coupon code—it’s only available for a limited time! Alright, we’re ready for the bomb-dropper. What’s the big deal with downloading sheet music illegally? It’s probably just a slap on the wrist compared to downloading music and movies, right? Get this; you can be fined up to $100,000, and you can go to jail for it too. Seriously, for sheet music? Yes friends, for sheet music. This goes for not only downloading sheet music illegally, but making copies of sheet music you have bought! When you purchase sheet music you are purchasing only one copy, and every additional copy you want must be purchased separately according to copyright law. And the law don’t care if you “didn’t know”, if you’re only an innocent kazoo player, or if you’re Winona Ryder. The law says, quote, “Nah, idc”. Savage. Simba, calm down. And yes, there is! If the law isn’t a good enough reason, you probably didn’t know that illegal sheet music is often inaccurate. Yep, you may very well be spending your time learning the wrong notes or chords. You may also be missing whole parts, even pages. This is because most illegal sites have unauthorized versions of artists’ music, so they’re usually not the real deal. Just like the days when you thought you were downloading Our Song by Taylor Swift on Limewire only to find out it was actually a Chinese man singing for 30 seconds. That was always a bummer. And if all else fails to convince you, just remember The Golden Rule. Musicians, of all people, should appreciate and understand the harm of someone stealing their work. Do unto others as you would have them do unto you.